In a society where so many of us are on the move—relocating because of employment, to be near extended family, or even just to pursue a dream of living somewhere new—staying connected is a real challenge. The Scriptures invite us to discover God's presence in a new place and in the midst of a changing community. Passages from the Old and New Testaments offer lessons that are fresh and relevant today. Justin Huyck is pastoral associate and director of adult faith formation at St. Michael the Archangel Church in Canton, Ohio. Previously, he served communities in Albany, New York; Northbrook, Illinois; and Kingston, Ontario. Justin is a graduate of Cornell University and holds an MA in theology from the Catholic Theological Union in Chicago. He and his wife are the parents of two children. 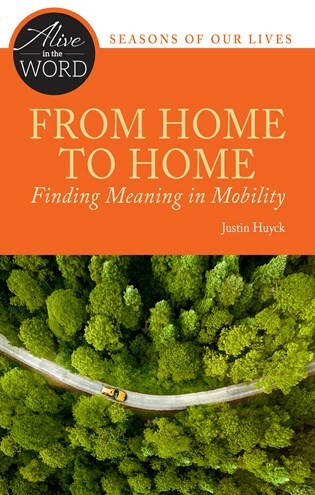 This reflection on `mobility' addresses an experience many people face, including those just beginning their careers. Justin Huyck draws on his own experience and theological insight to reflect on a series of apt biblical passages from the journey of Abraham in Genesis 11 to the refugee experience of the Holy Family in Matthew's gospel. It is well written, beautifully illustrated, and perfectly geared for individual or group reflection.